Pika on Rock (NPS Library)Last summer my good friend, the naturalist Jack Laws, joined me for a hike up to the Dana Plateau in Yosemite, one of my favorite places on earth. The rock filled plateau resembles a Martian landscape and presents an ancient geologic wonderland—the high alpine basin remained untouched by recent glaciations, and as a result, offers a rare glimpse of a landscape 25 million years old. The oddly shaped granite boulders that inhabit the area act as aged sentinels who have endured an eon of winds, rains, snows, and sun that have shaped their unique character. Mount Dana and its glacier also stand watch over the plateau and the adjacent Glacier Canyon. The entire area transports the visitor back to a prehistoric time—indeed, during my visits I would not have been surprised to observe a pterodactylus extending its enormous wings as it soared over the cerulean waters of Dana Lake. Dana Plateau, Yosemite National ParkYet for all the beauty created by the giganticness of the sweeping plateau and its imposing granite peaks, my favorite sight amidst this landscape is a small furry creature less than eight inches long who scrambles among the rock piles largely unnoticed. 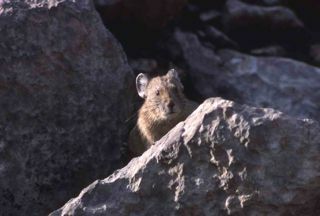 Observant hikers (and those lucky enough to have the company of such a gifted naturalist as Mr. Laws) can encounter the American pika (ochotona princeps ) in rocky terrain at elevations of 8,000 to 13,000 in Oregon, Washington, Idaho, Montana, Wyoming, Colorado, Nevada, California, and New Mexico. 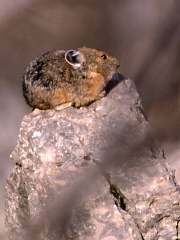 The Dana Plateau, with a landscape dominated by talus, provides the ideal habitat for these small lagomorphs, also fondly referred to as rock rabbits, boulder bunnies, or whistling hares. Pika in Yellowstone (NPS Library)Despite the impending storm nearby, Jack opened his sketchbook and began capturing the pika with his talented artist’s hand. We both watched, delighted, as one pika harvested a stalk of lupine and carried it between his incisors back to his rockpile home. Pikas do not hibernate, but collect various grasses, shrubs, and lichen, place the food into the sun to dry, and then stash it into a “haystack” for winter consumption. The nimble and deft pikas have also been known to loot their neighbors’ haystacks. For me, watching the rabbit-like pika scurry over talus fields is as essential to the beauty and character of the high alpine landscape as the requisite towering peaks. Sadly, the cheerful chirping of the pika may soon disappear from the high country as the effects of climate change have already reduced their numbers. Rising temperatures have diminished the already small islands of habitat for the cold-loving pikas (who can perish from overheating) and have pushed them higher up the range. If temperatures continue to increase, even the highest elevations may no longer provide a home for the pikas and the species may be threatened to the point of extinction. "Population by population, we're witnessing some of the first contemporary examples of global warming apparently contributing to the local extinction of an American mammal at sites across an entire eco-region." 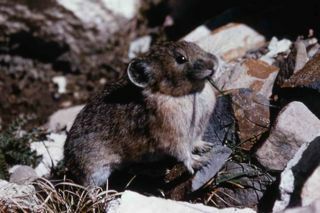 His study found that pikas had vanished from seven of the twenty-five sites he had surveyed over a ten-year period in Nevada, California, and Oregon. The World Wildlife Fund is continuing to provide grants for further pika research. Dr. Lara Hansen, a senior scientist with World Wildlife Fund Climate Change Program underscored the severity of the issue, "American pikas may unfortunately be the 'canary in the coal mine' when it comes to the response of alpine and mountain systems to global warming. Their disappearance is an indication that our heavy reliance on polluting fossil fuels is causing irreparable damage to our environment. We must make the switch to clean renewable energy resources like wind and solar now before it's too late." Sketch by Jack Laws of Pika on Dana Plateau Donald Grayson, an archaeologist with the University of Washington, also published a study on pikas in a recent issue of the Journal of Biogeography . "Pikas are an iconic animal to people who like high elevations," he said. "They are part of the experience. What's happening to them is telling us something about the dramatic changes in climate happening in the Great Basin. Climate change will have a dramatic effect including important economic impacts, such as diminished water resources, on people." Grayson notes that the Beever and Patton survey showed an increase of 1,700 feet in elevation in the range of the pika in Yosemite National Park. Today, pikas can be found only over 9,500 feet in Yosemite; in 1910, their range extended to as low as 7,800 feet. These alarming trends have spurred environmental groups into action. Earthjustice and the Center for Biological Diversity have partnered to petition federal and state agencies to list the American pika as an endangered species. Although the initial request was refused, another suit was recently filed in October. Although thunder began echoing off the surrounding granite peaks during our pika viewing, Jack and I remained in our observation seats, captivated by the movements of the hamster-like creature, who has managed to survive in an incredibly harsh environment despite its vulnerable appearance. I am grieved at the thought that our irresponsible environmental behavior may drive this intrepid creature to extinction. As much as I cherish the magnificent granite peaks, glacial lakes, and spectacular views of the Dana Plateau, something will be irrevocably lost from the intrinsic character of the land and from the delight of my experience if one of the smallest inhabitants of its landscape disappears and if when hiking through the talus fields I no longer hear the sunny chirping of the pika.